Hi everyone, Linda, the Funkie Junkie, here with some shop updates that I wanted to share with you. 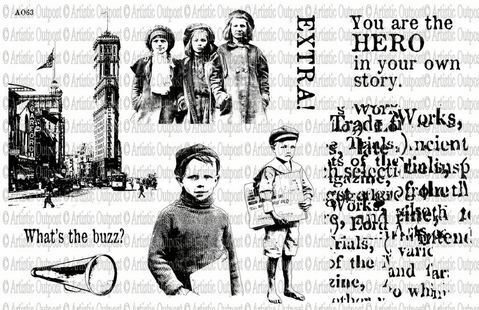 First of all, I'm excited to say that I continue to increase the variety of Artistic Outpost stamps and have some new listings to offer, including that awesome new plate that was just released today - Paper Boy. 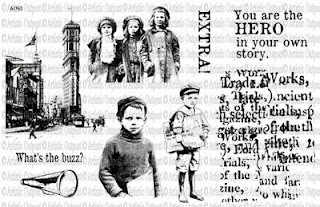 You can find all the Artistic Outpost stamps for sale in the Funkie Junkie Boutique here. I know some of you are hoping I get more distress paints in. I checked with Ranger and it looks like it will be quite awhile before they start shipping to shops that have already received one order. Realistically, it could be April or May before I can get the next shipment. When I can get more in stock, I will continue to offer the set of 24 for $89.99. If you would like to be put on a waiting list for a set, please email me at thefunkiejunkie@gmail.com. I also wanted to put out a heads up that my shop will have a shipping stoppage next week. You probably know I am a sole proprietor and if I am not able to do the packing and shipping, things don't get shipped. The store will remain open and orders can be placed, but I will be unable to ship beginning Wednesday, March 6th through Saturday, March 9th. Shipping will resume on Monday, March 11th. Layer it On and Share a Word! A warm welcome back to week 2 of the Layer it On and Share a Word challenge. This week, our Funkie team is sharing their interpretation of this challenge theme. Scroll down to the bottom of this post for the Week 1 post with all the challenge details. We are thrilled with all the fabulous participation so far for this challenge, but if you haven't played along with us yet, there is still a whole week left. So get busy, layer it on and share a word! Hello and welcome to the next Frilly and Funkie challenge! It's Sue here and for this challenge we want to see lots of layers, this could be layers of paint, paper, fabric or whatever else you have to hand. The twist is the focal point must be a word. This may be the perfect opportunity to use up all of those scraps you have on your work desk! Here is some fabulous inspiration from the Design Team to get you started! Good Monday morning to you. I hope you all had a fantastic weekend. 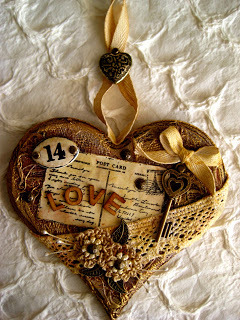 It's time again to announce a challenge winner, this time for Terry's Lacy Heartsy Valentine's Project. We had such a wonderful array of beautiful Valentine's celebration projects and we loved seeing your creativity! Thanks so much to each and every one of you who shared your amazing creativity with us! The design team has voted and our Funkie Favorite for this challenge is Janny Jager 't Hooft with this yummy vintage confection. 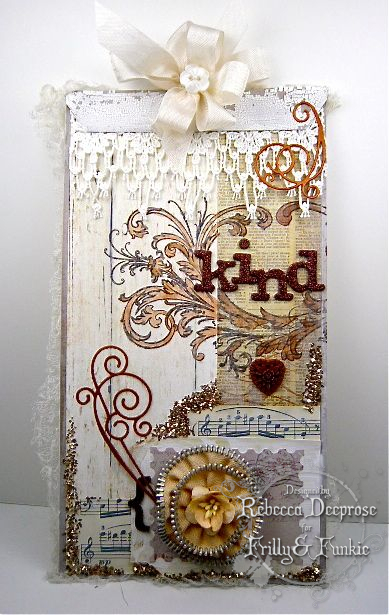 Gorgeous sepia tones and outstanding embellishments and textures. Congratulations Janny! 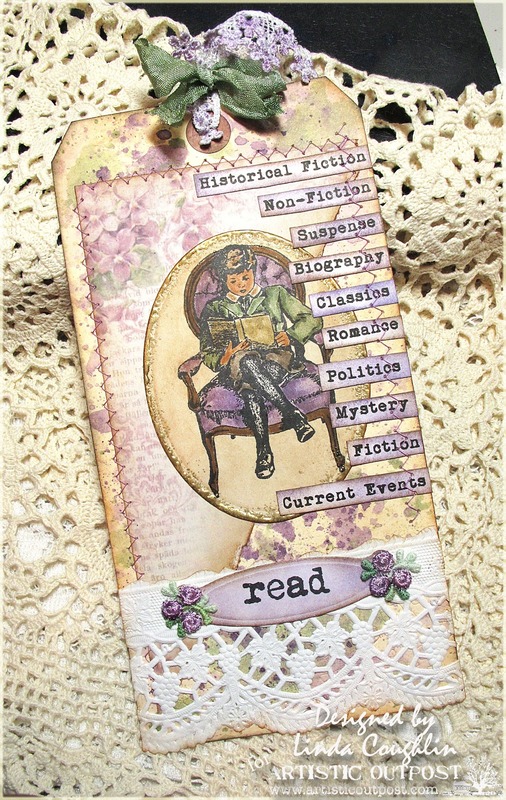 You have a Funkie Favorite badge coming your way and we hope you will proudly display it on your blog! We have another winner too. Random.org has selected entry #2 - Angela, as our winner of the $25 gift certificate to shop at The Funkie Junkie Boutique. Congratulations to both winners. Please email mea t thefunkiejunkie@gmail.com for your prize codes. We have another wonderful challenge running through March 5th. The challenge is Layer it On and Share a Word. Hope to see you playing along! Hi everyone and thank you for joining us. 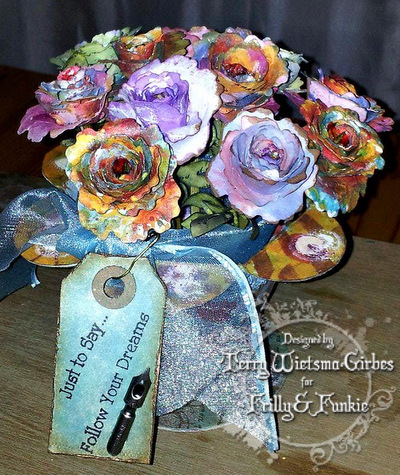 Buttons here with this week's Frilly and Funky Step by Step. 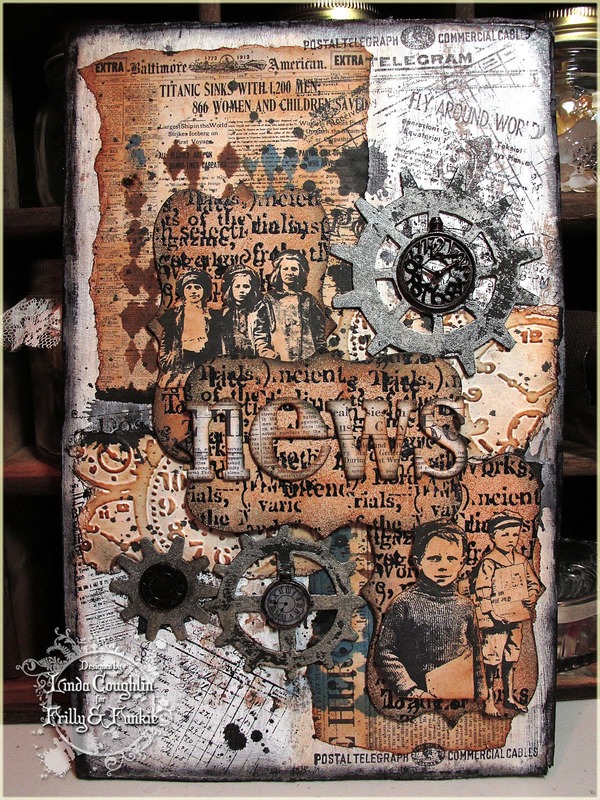 I've mentioned before how good grunge paper is for making rusted gears and having recorded the recipe it seemed a good idea to share it with you. Start by die cutting your grunge paper - with some machines this may take a few passes and sometimes they cut better at the edges of the plates as that is where the most pressure is exerted. Cover the grunge paper in black alcohol ink (you could use a pad or even a marker instead). Finally dab on some Tarnished Brass Distress Stain and dry. Now they are ready to add to your projects. And here's a close up to finish this week's instalment. Happy Friday Everyone! Thanks for stopping by Frilly and Funkie for this week's Friday Focus. Hey, say that three times really fast...Frilly and Funkie Friday Focus, Frilly and Funkie Friday Focus, Frilly and Funkie Friday Focus! Sorry...couldn't resist! Donna here to show you some tags using the Tim Holtz Sizzix Alterations Brick Wall and Cobblestone Decorative Strip dies. Of course, since they are the subject of our Friday Focus that means that these two dies are available for an additional 15% off of the already discounted price at The Funkie Junkie Boutique! You should snap them up now! These dies may seem challenging to use but it's really easy to get great results with them. 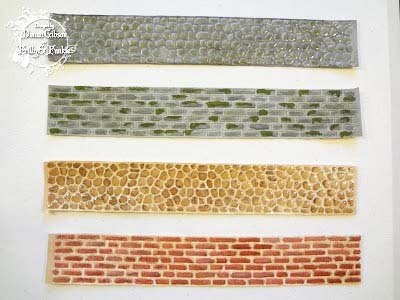 They can be used as wall, a walkway or to create a brick or cobblestone finish on another die cut. I created two versions of each die as shown below. Depending on how you color them the possibilities are endless! I'll be back on another day to give you the StepXStep on how I created each of these. And at that time I'll share another project (or maybe two!) as well. For today I have two tags to share with you! On this tag I used a piece of the mossy brick wall. The great thing about these dies is that the finished strip is long enough that you can use it on multiple tags or cards. I plan to create more of them to have on hand for adding to my art! On this tag I used the brown cobblestone strip. My intention was for Umbrella Man to be standing in front of a wall but I realized, just now, that it looks like he's standing on the wall! So it might look to some of you like he's standing on a cobblestone walkway! I used multiple diecuts to create the outfit on Umbrella Man. I recently saw this technique on Richele Christensen's blog here and wanted to try it...genius! I hope that I've sparked some ideas for you with these tags. As I mentioned, I'll be back with a StepXStep to share my technique for creating these strip dies as well as to share some additional projects. So be prepared by ordering these strip dies now while they are being offered at an additional discount! Thanks so much for joining us today! The following items that I used on my projects can be found at The Funkie Junkie Boutique! The boutique offers merchandise for up to a 20% discount from the typical retail price!